The term “archaeoacoustics” simply means the study of sound in archaeological contexts. There are two basic ways this can be done, by exploring natural sounds and acoustics at monuments and other sites, or by investigating and measuring the acoustic parameters of a place by use of electronic instrumentation. invented independently by many different cultures. They often have great ritual or religious significance and are strongly connected with male initiation rituals. In some societies bullroarers are taboo to women, who are not allowed to see or hear them. To sound a Bullroarer it is swung lasso style which causes it to spin and make a ‘humming type’ sound. It is called by several different names including ‘Burliwarni’, ‘Ngurrarngay’, and ‘Muypak’. They were used to display sacred symbols and sounded to warn the uninitiated that they were being shown. They were also used to send animals into ambush, and to alert one tribe of another’s presence, and in rainmaking ceremonies. people more than a thousand years ahead of Stonehenge and the pyramids. The monuments, including ancient temples, represent free-standing architecture in its purest and most original form. Design features including corbelled ceilings, are mirrored in subterranean mortuary shrines that have been carved out of solid limestone. (In architecture, corbelling is a system of a row of stones oversailing the one below it, reducing the area of the ceiling with each row upward and distributing its weight.) Malta’s Hal Saflieni Hypogeum provides the most extraordinary example. A multi-leveled complex of caves and ritual chambers, it is a gem of archaeology. Malta’s subterranean Hal-Saflieni Hypogeum, architecturally intact after five thousand years, is known to have anomalous sound effects. This site’s architectural features not only mirror the above-ground megalithic buildings, but also imply a primitive understanding of acoustic behavior. Could this natural phenomenon lend weight to the theory that the development of monumental architecture may actually have been prompted by a desire to manipulate sound effects for some unknown practical and/or ritual purpose? Can such remote antiquity hold new relevance for science and modern behavior studies? Pilot findings suggest that the acoustic properties of ancient structures may influence human brain function. In shifting of brain function, it stimulates an area of the brain that bio-behavioral scientists believe relates to mood, empathy and social behavior. A room in the Hal Saflieni Hypogeum known popularly as “the Oracle Chamber” is suspected to have its strongest resonance at precisely 110 Hz. It also looks suspiciously like the prehistoric architects carved in amplifiers. Previous archaeoacoustic investigations by Robert Jahn have examined the acoustic properties of a sample of chambered prehistoric (primarily Neolithic) megalithic structures in England and Ireland, including the major passage of Newgrange, Ireland (constructed c.3200 BC). These structures were found to exhibit a common acoustic property: all were characterized by primary resonance frequencies in the 95–120 Hz range, with most at 110–112 Hz. Notably, the central chamber of Newgrange, the largest and most architecturally sophisticated of the sites tested in that work, displayed a primary resonance frequency of 110 Hz. In some cases, fairly massive stones had been placed at particular locations within the chambers apparently to adjust their physical properties and yield these resonant properties. One suggestion has been that cavity resonance may have been designed to support human ritual chanting, because the resonance frequency lies within the human vocal range. Emain Macha, also called Navan Fort, (54.34°N 6.69°W) is 2,518 miles from Giza, or 10.1%, and was comprised of a central octagonal wooden building once supported by four concentric rings of posts, surrounded by a large circular enclosure made by a bank and ditch. Among the Celtic artifacts unearthed at Emain Macha is a gold-alloyed ‘gong’ with a mandala relief carving (above) which presents a central 3-fold symmetry surrounded by an outer ring of 10 sets of concentric circles, composed of 3 circles each. It is quite notable that the 10-fold symmetry of the concentric circles reflects the 10% distance of Emain Macha to the ancient prime meridian of Giza, Egypt. Giant stone bowls found at sites like Newgrange confirm what scientists have been able to reproduce in the lab — that acoustic levitation can be achieved using concave piezoelectric elements to focus standing waves. Dr Aaron Watson, an Honorary Fellow at the University of Exeter, has spent a number of years investigating the effect of sound at some of the county’s best-known prehistoric sites, especially Orkney’s chambered cairns. After repeated visits to measure and record audio data, Dr Watson is of the opinion that sound played an integral part in the rituals and ceremonies surrounding sites such as Maeshowe and the Ring o’ Brodgar. His research shows that certain prehistoric monuments exhibit specific sonic effects. At Maeshowe, for example, specific pitches of vocal chant, as well as drumming, inside the cairn produced specific, unsettling, effects in those present. In the chamber, the behaviour of sound was seen to be considerably different from that of the outside world, with the ancient stone walls amplifying noise to create a variety of audio effects. One of these effects is the phenomenon known as “standing waves”. These produce distinct areas of high and low intensity as the sound waves interact – either cancelling each other out, or combining to enhance, the sound. But perhaps more incredible is the idea that infrasound – sound below the ability of humans to hear – generated in the cairns could alter the mental states of those participating in ceremonies. The principle of “Helmholtz Resonance” – the phenomenon of air resonance in a cavity – was found to apply to a number of prehistoric cairns. The most commonly-used example of this phenomenon is the noise created when blowing across the neck of a bottle. Maeshowe, for example, shares the same basic structure as a bottle – an air filled chamber connected to the outside world by a long, narrow neck. To create this effect, the users of the cairn had to create a sound that was at the correct frequency for the dimensions, and design, of the chamber. The larger the chamber, the lower the pitch required to create the effect and, therefore, the slower the required drumbeat. In Maeshowe, a drum was used and the researchers discovered that the correct frequency was 2 hz. 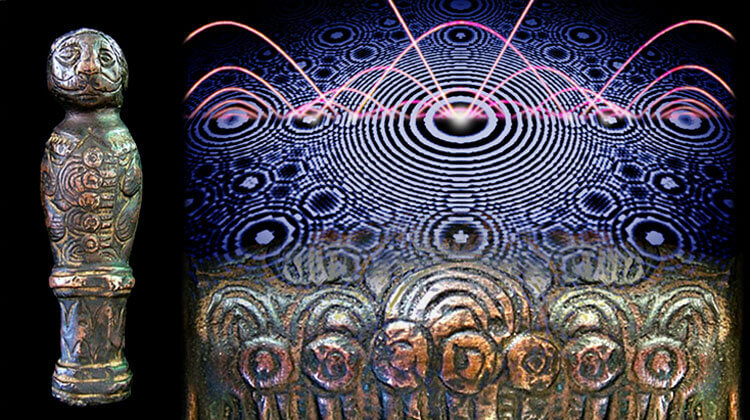 This is an “infrasonic frequency” which means that, although inaudible to humans, it can be felt as distinct physical, or psychological, sensation. Test subjects reported the feeling that sounds were emerging from inside their head and body. They experienced feelings of dizziness, nausea, headaches, flying sensations and also that their pulse-rate was being affected. Sound may also have played a part at the nearby Ring of Brodgar. Although only 27 of the ring’s estimated 60 megaliths remain, Dr Watson recorded distinct echoes across the interior. Sound created at the edge of the circle, for example, produced indistinct echoes, reflected from the other stones. Sounds made at the centre, however, echoed back and appeared to envelop the listener. Using handclaps or drumbeats, the delayed echo also made it appear as though the stone were producing a separate sound themselves. change, its acoustic qualities would also have been transformed. While it is difficult to reconstruct the acoustics from these earlier times, it is possible to study final form of the monument as it stands (dating to between 2500 and 1600 BC). Research here is further complicated because many stones have fallen, or been removed altogether. Developed in collaboration with acoustician Dr. David Keating, the acoustic tests at Stonehenge were intended to test the most fundamental properties of the monument. An omni-directional loudspeaker was placed at the centre of the large stone circle, and a series of measurements taken along a straight line leading from the centre towards the Heel Stone and Avenue. Overall, the results suggested that the stones at Stonehenge are able to contain and amplify higher frequency sounds, such as the human voice. In contrast, lower frequency sounds such as drums pass around these sarsens and can be heard for some distance. This means that most sounds made in the centre are not clearly transmitted beyond the rings of stone. A fascinating, though seldom discussed, mystery at Chichen Itza concerns the strange acoustic anomalies observable at the great ball court and the temple of Kukulkan. Words softly whispered at one end of the great ball court (measuring 545 feet long by 225 feet wide) are clearly audible all the way at the other end and a single clap or shout sounded in the center of the ball court will produce nine distinct echoes. Visitors have also commented on a curious acoustic phenomenon at the pyramid of Kukulkan where the sound of a hand clap is echoed back as the chirping sound of the Quetzal bird, the sacred bird associated with both the name of the pyramid and its deity Kukulkan/Quetzalcoatl. Moving to archaeological issues, it is considered whether the echo was intended by its Mayan builders; is merely an artifact of reconstruction; or simply an ancient acoustical design defect. We speculate that the echo is intentional. That the steps were designed and constructed to echo the voice of the Mayan sacred bird, the resplendent quetzal (pharomachrus mocinno), viewed by ancient Maya as the “messenger of the gods. Chavín de Huántar is an archaeological site containing ruins and artifacts originally constructed by the Chavín, a pre-Inca culture, around 900 BC. The site is located 250 kilometers (160 mi) north of Lima, Peru, at an elevation of 3,200 meters. The importance of site acoustics is suggested by distinctive architectural features, notably an extensive network of underground galleries used in part for ritual purposes. The labyrinthine galleries are stone-walled and arranged in a series of small rectangular alcoves off narrow corridors. Preliminary acoustic measurements of three galleries at Chavín de Huántar indicate short reverberation times. Early reflections are energetic, become quickly dense, and are widely distributed in arrival direction; this predominantly noncoherent energy density results in envelopment and vague localization cues, despite the short reverberation times. Such an auditory space is unusual in the natural world, and may augment the positional disorientation induced by the labyrinthine layout. It appears that these tunnels are quite unique and were specifically constructed to create such effects, perhaps the Chavin intended for this to be the case and employed their knowledge of sound and acoustics in intentionally building the various labyrinths. German archaeologist Dr Heinrich Kusch said evidence of the tunnels has been found under hundreds of Neolithic settlements all over the continent. In his book – Secrets Of The Underground Door To An Ancient World – he claims the fact that so many have survived after 12,000 years shows that the original tunnel network must have been enormous. ‘In Bavaria in Germany alone we have found 700 metres of these underground tunnel networks. In Styria in Austria we have found 350 metres,’ he said. ‘Across Europe there were thousands of them – from the north in Scotland down to the Mediterranean. The collaborative efforts of many different research teams, having collectively explored hundreds of miles of subterranean tunnel systems, reveals a systematic technology of acoustic resonance that informed a different way of life during Neolithic times. Ancient Europeans were spending vast amounts of their time and energy living in, and expanding, their vast underworld, as well as creating massive walled structures above ground to protect the entrances to their tunnels. While some researchers falsely assume that the dangers of roving cavemen drove the ancient societies to protect themselves behind huge walls and in deep tunnels, another more likely conclusion exists. The piezoelectric properties of the stones used in the megalithic walls and comprising the tunnel walls was employed by ancient societies for special acoustic applications – for reflecting standing waves. The thickness of the stone structures provided better reverberation times and allowed for efficient acoustic energy focussing and storage for healing and longevity by transducing infrasound standing waves from the Orion pyramids of Giza, Egypt. We now know that sound was important to, and probably considered magical and mysterious by, people at least as far back as the Palaeolithic (Old Stone Age) painted caves of France and Spain, dating to tens of thousands of years ago. It has been found that some of the stalactites and stalagmites in them are musical, in that they will issue pure bell-, drum- or gong-like notes when struck. Some archaeologists refer to these musical calcite formations as “lithophones”. Most if not all of these relatively rare features had been painted with geometric signs and animal figures in Stone Age times, and they also display ancient percussion marks – so ancient, in fact, that they are visible only through a covering of calcite deposits. Currently, Russian and Finnish researchers are studying “palaeoacoustic” ringing rock sites on the shores of Lake Onega in Russia. They have found that the sound these natural stone “drums” make when struck is amplified by the surface of the lake, causing it to carry for kilometres around. The features are surrounded by concentrations of rock art. Similarly, archaeologists in the United States have identified “ringing rocks” – boulders that emit bell- or gong-like sounds when struck. Many of these, too, are marked with rock carvings. Ringing rocks also occur in Europe (and elsewhere, of course) – a musical boulder carved with prehistoric markings is known of in Scotland, just for example, and Mynydd Preseli, Wales, source of the Stonehenge bluestones, is currently being examined for similar features in the acoustic mapping work of the Landscape and Perception project’s Pilot Study. More recent work in the USA, Australia and elsewhere by American acoustic researcher, Steven Waller, indicates that some prehistoric rock art panels produce echoes that act like “soundtracks” to paintings of animals, simulating the rumble of depicted animal herds, for instance, or the roar of a lion or sabre-toothed tiger. In Canada, the mighty cliff known as Mazinaw Rock rises out of Mazinaw Lake in the aptly-named Bon Echo Provincial Park, Ontario, produces exceptional echo phenomena. Along the bottom of the cliff face, just above the waterline, there are many dozens of red ochre rock paintings, produced about a thousand years ago by the ancestral Algonquin people. The echoes are particularly noticeable where these rock art panels cluster. The Native American tribes of the Great Lake region believed that a spirit world existed behind rock surfaces, which were conceived of as being like “membranes” between that world and this. Places where rock met water were thought to be especially propitious locations for rock manitous or spirits to exist. (These are also the locations where echoes are strongest.) The Indians thought that while in their ritually-induced trance states, their shamans could penetrate through cracks and crevices in the rock-face into the spirit world beyond, and also that spirits could pass through from behind it into the human world. It is not hard to appreciate that echoes would have been considered part of such traffic. Archaeoacoustic researchers are finding that there can be other sonic properties to archaeological sites. Sometimes, they can be manifested by wind, water or heat expansion sounds issuing from crevices in the rocks of natural sites (which then became venerated and often marked by rock art), or by blowing into holes in venerated rocks. Also, the architecture of some temple structures appears to have been deliberately designed so that percussion or wind would produce sounds providing weather warnings or even quite sophisticated “acoustic symbolism”. Examples of all these types of acoustic sites have been identified in the United States, Canada, Mexico, Greece, Britain and elsewhere, though there is much more research to be done. It has to be remembered that archaeoacoustics is a study as yet in its infancy. And yet, the formal sensibilities that are the roots of today’s installation art are to be found within its remit. Life in recent centuries was by no means sombre and silent, so perhaps we shouldn’t assume it was in prehistory.